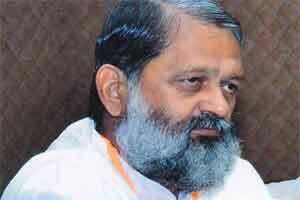 Chandigarh: A day after terminating the services of six office-bearers of the National Health Mission Employees Association for going on strike, Haryana Health Minister Anil Vij issued directions to recruit new staff to ensure uninterrupted health services in the state. Vij directed the officers concerned to prepare for recruitment of new staff so as to ensure uninterrupted provision of health services in the State, an official spokesman said. The Minister, who was presiding over a meeting of officers of the department, directed Director General, Health Services Department, Kamla Singh to ensure that essential services in all hospitals remain uninterrupted. Mission Director, NHM, Saket Kumar said all NHM employees in several districts had returned to duty and action was being taken against those who had failed to do so. Meanwhile, a large number of protesting employees today met Kumar and appealed to him to reinstate the dismissed employees. However, the Mission Director denied their demand and urged them to call off their strike. Yesterday, services of six office-bearers of the National Health Mission Employees Association were terminated for going on strike. The NHM officials whose services had been terminated included president NHM Association Surender Gautam, vice president Vijay Kamboj, general secretary Atul Gijwani, and members Vikram Soni, Tarandeep Singh and Pushkar Dahiya, Vij had said in an official statement here. The Association had given a call for indefinite strike throughout the state from yesterday to press for their demands, including regularisation of their services.